March was a blur. February was a blur, too. I was teaching, polishing off the “final” draft of my dissertation, making presentations at a regional conference, and keeping myself afloat (and my personal life from coming apart at the seams). We also celebrated my preschooler’s 4th birthday and I welcomed the break from mad-editing my dissertation project to make felt bluebirds and pipe-cleaner flowers for her party. I have been thinking about writing since I submitted my dissertation project to my committee last week. With a full draft “complete” and pending feedback from my committee, I have found myself without something to write. Now that I’m almost “finished”–and in academia, we’re never really finished with anything until it’s in press–all of those words I have been writing are now words I wrote. As I paged through the document, I could not feel prouder that I wrote all of those words. My project is actually written. What was once an active process suddenly feels passive. 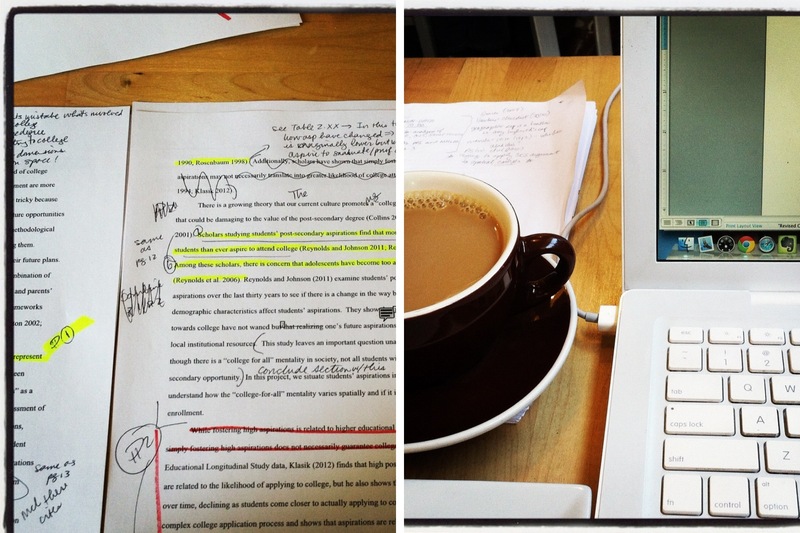 What happens when what you’ve been writing (and editing and re-writing and re-re-writing) becomes something you wrote? I have found that I am not handling the transition very well. Even though I have advised new graduate students to plan for the transition from one project to another, I am struggling to stay focused. This lull in my day to day work life has left a considerable hole. Over the last two months, I have not been able to devote time to writing and blogging in the same way I had during the fall semester. 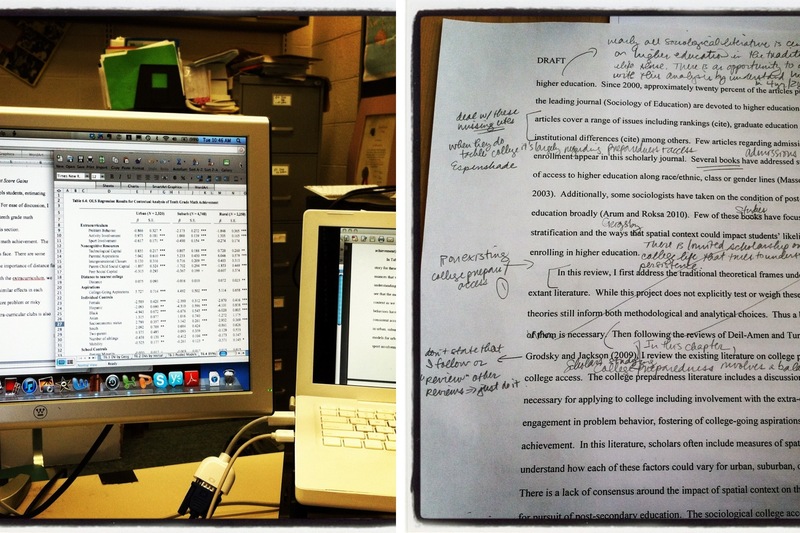 Blogging provided a balance to my scholarly writing. Blogging gave me a chance to simply write. Part of the reason I like blogging is that I have control over what I write, how I write it, and when I share my writing with readers. In academia, it rarely works this way. As a graduate student, you work in concert with mentors and advisors and sometimes with other graduate students. As an early career scholar, you’ll engage with academic publishing where most research and writing is subject to peer-review. Even outside of academic publishing, I’ve submitted two essays to an online publication and they’re also subject to an editor’s approval (see them here and here). Other people will always be involved in the words I write. As I approach the end of my graduate training, I think it is important to pause and enjoy the progress I’ve made. I’ve agonized over sentences and words, formatted table after table and figure after figure, reformulated my own thoughts and ideas, and in the end, learned quite a bit. Now to decide what to write next. This entry was posted in academia, blogging, dissertation, grad school, higher education, lessons learned, teaching, work, writing. Bookmark the permalink. In this lull, perhaps you could write your bio for your storytelling event. I’ve heard that the organizers would like it sooner than later.